The week leading up to our Easter/Spring break was a bit of an experiment. Titled “Școala Altfel,” the Romanian Ministry of Education tasked schools to provide students with one week of nontraditional education. In a normal school day students go from one classroom to another, from one subject to another, have their lectures and do their assignments. The literal translation doesn’t really do the title justice, but essentially the idea behind Școala Altfel was to get students out from behind their desks and involved in more hands on practical exercises. Each class of students is assigned to a Headmaster or Diriginte for the four-year high school term. 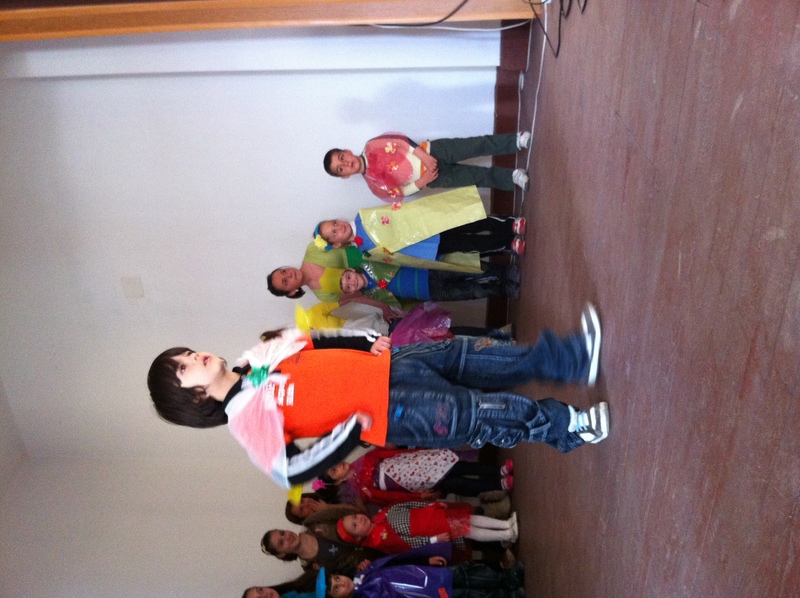 During this period of Școala Altfel, each class remains with their Diriginte for five full days. This certainly has its own challenges ─ after all how do you keep the same group of kids interested for a whole school week? In the end, the experiment was a success for our school, with all of the participants taking something positive away from the experience. 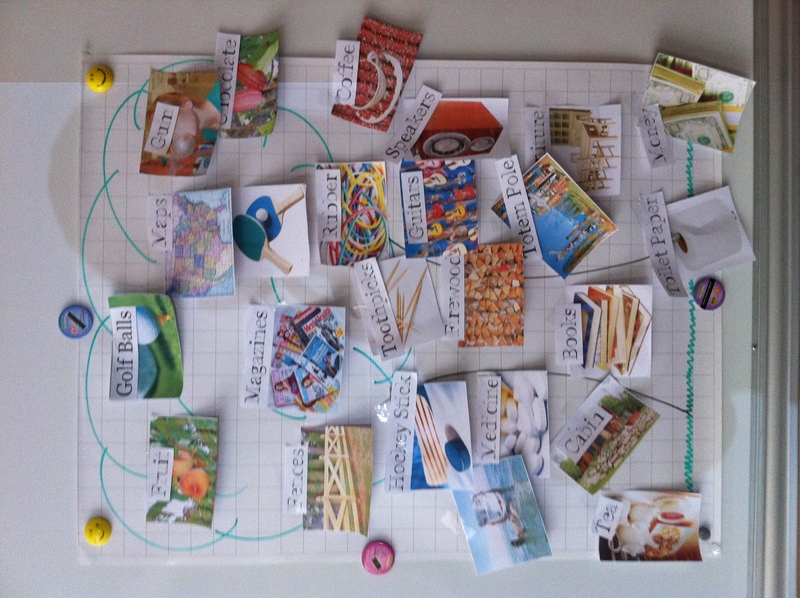 Reduce, Reuse, Recycle Presentations: We broke our class of thirty students into six groups of five and assigned them the task of researching and creating a presentation on the Three Rs approach toward the environment. We provided a basic framework for what each slide should include, helping to ensure they stay focused on the task. The students were allotted a couple of hours in the computer lab to work on their projects and then a couple of hours to project and present them. We judged each group for content, design and presentation skills. Each member of the winning team was then awarded with a Snickers bar. Overall the final presentations were good; general problems that students here struggle with are plagiarism from Wikipedia, too much written content on individual slides, and budding public speaking skills. So we took the opportunity to address these challenges and hope to see improvement in the future. Arts and Crafts: The Ecology Engineer led a handful of sessions where students took old thrown out stuff like plastic bottles and repurposed them for a second life. First, they made rain gauges by cutting off the top quarter of a two liter plastic soda/water bottle, filling the bottom with play dough so as to smooth it out and then reattaching the inverted detached top, turning it into a sort of funnel. The idea was then to place the rain gauge in gardens at home to measure the amount of rainfall. Next, they took old plastic cups, straws, pencils and bits of scotch tape and made wind speed measuring devices. By mounting two long straws with small plastic cups (used for coffee here) mounted to the ends, to the eraser end of a pencil with a metal sewing pin, wind would catch in the cups and cause the straws to spin atop the pencil. The number of revolutions made within a set period of time would dictate how fast the wind was blowing. 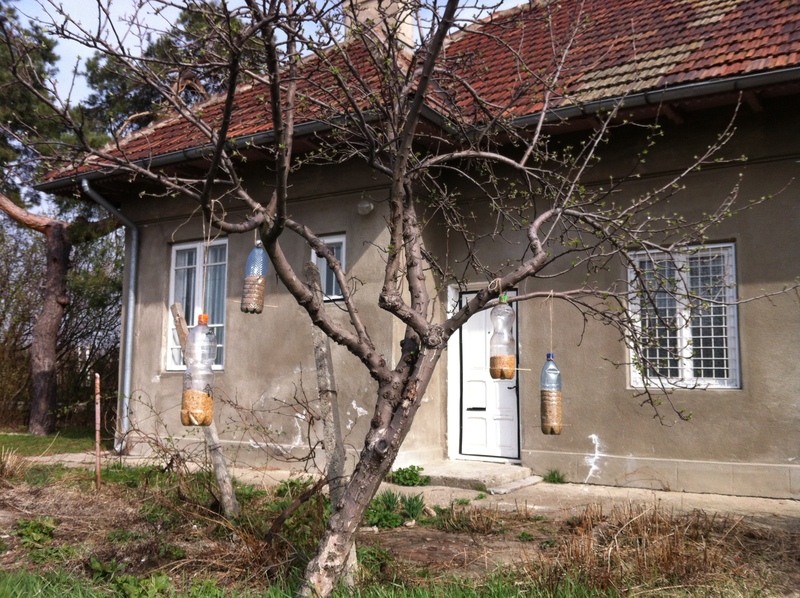 Finally, we made bird feeders by taking old plastic bottles, filling them with seeds, putting wooden sticks through the bottom and then poked several holes on each side. The birds at first seemed slow to take to the idea, but I now have two empty bottles hanging from the apple tree behind my house. Kindergarten Collaboration: Since our high school also has a small building on campus dedicated for a kindergarten we thought it a good and convenient idea to have our students work with the children at the kindergarten. 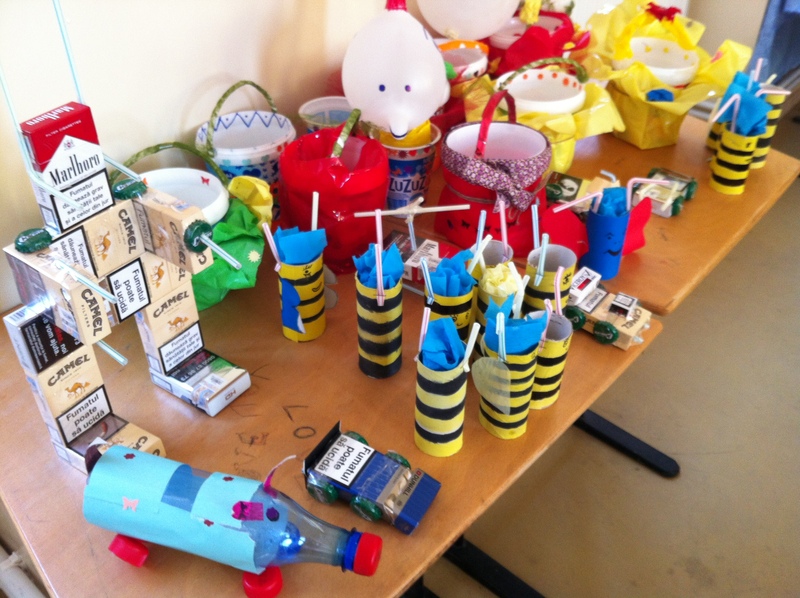 One activity was devoted to making kid’s toys from used products like old bottles, used cigarette boxes and paper towel rolls. 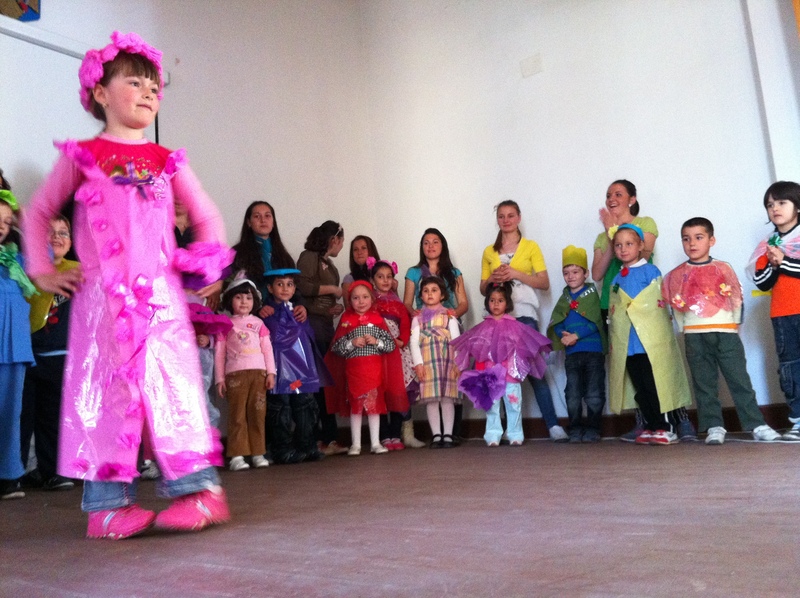 Another activity was to create costumes for the children from recycled goods and then to have an “Eco Parade” in the main auditorium with music and dancing. Tree Planting: The U.S. Embassy in Bucharest, in conjunction with the NGO Mai Mult Verde, came up with the idea to help a handful of Peace Corps volunteers plant trees in their respective communities. My counterpart and I were among the first to apply and to be awarded the funds. Thus we purchased twenty-two trees to plant in a vacant patch of grass in front of the school. 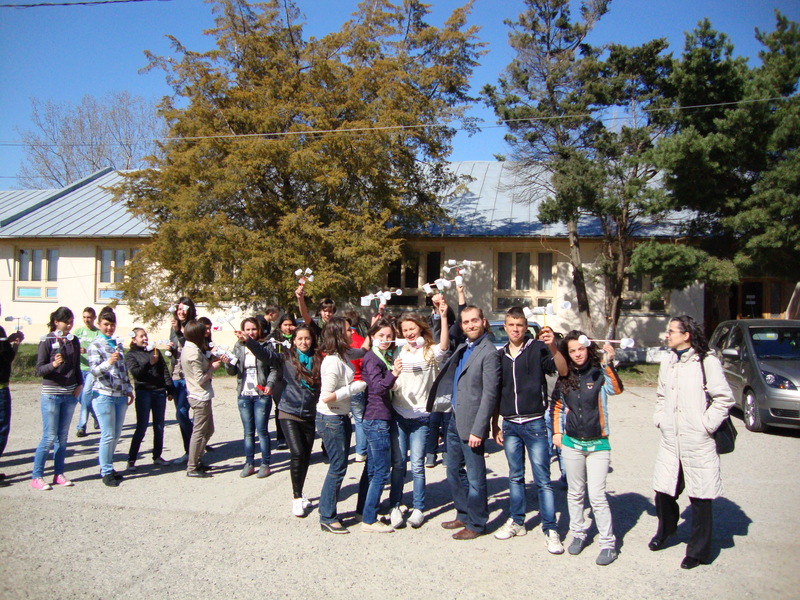 The number twenty-two represents one tree for each year that Peace Corps has served here in Romania. To conclude the project, the awarded communities received a commemorative plaque to erect in line with the saplings. Our students eagerly engaged in this process, marking out the right spots, digging the holes and learning how to properly plant trees from an Engineer here at the school. In addition, a Peace Corps Volunteer Leader, who is currently assigned to work with Mai Mult Verde, came to the school to give a presentation about volunteering and about taking care of the environment. As a first time experiment here in Romania, I feel that Școala Altfel was a success, at least from the standpoint of my school. There was a refreshing buzz all around campus with students engaged in cleaning up the property, posting signs encouraging good behavior and beautification projects to put a fresh coat of paint where needed. The trick now is to find a way next year to top the success we had this year. Note: If you are viewing the e-mail version of this post please click on the blog title above to view the photographs.